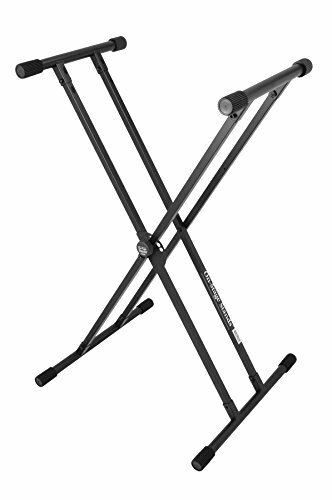 On Stage KS8191XX Double X keyboard stand is perfect for musicians who want tough, durable quality without spending a fortune! This On Stage stand features a classic bullet-nose pull knob for height adjustment, 27 to 39 inches. With the Lok-Tight system it provides a 5 position adjustment disk and steel reinforced clutch and center hinge. These features make for simple width and height adjustments. The welded Double X workhorse adds stability and holds more weight, up to 200 lbs!